Thoroughbred Ford: Thoroughbred Ford -Free Concert Tickets! 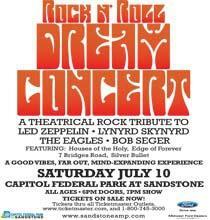 Tribute bands Houses Of The Holy (Led Zeppelin), Edge of Forever (Lynyrd Skynyrd), 7 Bridges Road (The Eagles) and Silver Bullet (Bob Seger) will be performing at this year's Rock N' Roll Dream Concert. Free tickets available for this concert at Thoroughbred Ford! All you have to do is come to our front desk and ask for them. We will run out quick, so get them before they run out! !